This approach clarifies much of the mythology of American betrayal in Angola, and allows us to see the Cold War in the global south in a new light. In April 1974, Portugal’s spluttering right-wing regime collapsed. Its successor promptly announced its intention to divest Portugal of its five-century-old empire, including colonies in Angola and Mozambique. The apartheid regime in Pretoria looked at these events in the context of two very different paradigms. The first was the deep belief of Prime Minister John Vorster and his allies that black and white Africa did not have mutually exclusive goals and that through trade and cooperation, mutual understanding and a modus vivendi could be established. This had much to do with domestic state-building, as well as geopolitics. Much of the previous decade of South African politics had been dominated by a sudden shift towards redefining the South African polity in the language of the post-colonial nation-state. Afrikanerdom was defined resolutely as “African”, with extensive repositioning of its history in authochthonous terms of land, culture, and belonging and a move away from rhetoric of racial supremacy within a singular South African society. In this new paradigm, what mattered was long-term acceptance of the white polity by those leading the campaign to delegitimise South Africa and its apartheid system: black African states. Other factions within the government saw this thinking as misguided at best. Supported by an increasingly proactive and cohesive bureaucratic power base in the military, Defence Minister P. W. Botha believed that the anti-apartheid hostility of African nationalism was merely a tool of a communist “total onslaught” aimed at the riches and strategic position of South Africa. Where Vorster concentrated on influencing the character and discourse of African nationalism, Pretoria’s defence hawks instead relentlessly targeted the communist cancer that they saw eating away at its core. “In the situation which currently exists, an African threat and a Soviet and/ or Chinese threat cannot be meaningfully discussed separately,” observed one major defense force report. Into the 1970s, these two idiosyncratic philosophies on South Africa’s relationship to the outside world developed side by side. Although already pulling its statecraft in contradictory direc­tions, the tension between them remained largely inchoate and did not yet mani­fest itself in debilitating policy wrangles. The one area in which the two paradigms overlapped was hostility to communism. The resonance of this localised version of global anti-communism ran deep, sustained by domestic political imperatives: the need to discredit proposals to share power and wealth across South Africa’s rigidly stratified society. The National Party’s anti-communism may have been more virulent and more entrenched in state institutions than in any other “Western” country. For example, though far removed from the early Cold War conflicts, South Africa eagerly volunteered its air force for the Berlin airlift in 1949 and the Korean War the next year. In 1956, the South African government unilaterally closed the Soviet consulate in Pretoria. And the Suppression of Communism Act (1950), already draconian, was tight­ened in 1951, 1954, and repeatedly during the 1960s. It covered many more political activities and punished them more harshly than parallel legislation elsewhere, like the Communist Control Act in the United States. Overall, the Afrikaner fear of communism was not merely political, but existential, linked to threats to the racial, national, class, and religious components of volk identity simultaneously. These perceptions in turn supported the regime’s identification of communism as inherently foreign, by definition an external menace rather than a legitimate political ideology. As different movements jockeyed for post-colonial power in Angola, South African policymakers quickly pigeon-holed them to suit their own particular Cold War ideological framework. The National Liberation Front of Angola (FNLA) and National Union for the Total Independence of Angola (UNITA) were deemed anti-communist. The Popular Movement for the Liberation of Angola (MPLA) was instead seen as “communist”, part of the emerging “total onslaught”. The reality was much more complex; FNLA forces were receiving training from Communist China at the very time that these judgments were being made. Nevertheless, in July 1975, the apartheid regime promptly agreed to send its newfound anti-communist FNLA and UNITA allies 20 million rand worth of arms and equipment. As in the Congo a decade earlier, and in Rhodesia and the Portuguese colonies over the preceding years, the apartheid regime had decided to outsource the effecting of its national security goals to avoid drawing attention to itself and its apartheid policies. P. W. Botha was gung-ho about the entire enterprise. Vorster, heavily focussed on building bridges to anti-communist African states like Zambia, Malawi, and the Ivory Coast, was much less keen. He gave his Defence Minister lots of leeway in dictating the flow of arms, aid, and training to the anti-communist alliance. But the apartheid regime had a problem: the FNLA and UNITA were terrible allies. South African Defence Force (SADF) reports soon emerged from the front noting that their rag-tag armies had no conventional warfare experience and could not use the South African equipment effectively. The consensus was clear: white South African command, logistics, and troops were needed. A support role would not be enough. As he had since July, P. W. Botha pushed hard for escalation. He put these recommendations in front of Vorster, with a short handwritten note: “I think we have to do it. We will implement [toepas] with great secrecy.” By mid-October, SADF columns were in Angola and moving northwards fast. South Africa’s was not the only covert operation on the ground. By the first week of August — just as the first South African arms shipment arrived — the American Central Intelligence Agency (CIA) program in Angola had “grown into a full-fledged covert action program,” in the words of one agent involved. But contrary to subsequent accounts, the American and South African efforts were parallel, rather than intertwined. Prior to Vorster signing off on the 20 mil­lion rand assistance package, his government approached the Americans about a fully coordinated joint effort. The Americans demurred. The newly declassified version of the minutes of the National Security Council (NSC) meeting on June 27 records Director of Central Intelligence William Colby as saying: “South Africa would like us to join with them in an effort, but we can avoid the problems that would create and deal with the black [African states]. Some [of these] would be encouraged for the US to take a role, and that would activate them.” Washington followed Colby’s advice and rejected Pretoria’s entreaties. In this context, Washington was happy to allow the South Africans to surreptitiously represent its interests. Angola was a very low priority for the Ford Administration until the arrival of Cuban forces in October 1975 sharply escalated the conflict’s Cold War significance. The CIA did not even increase its budget for the Angolan program until the end of November, at which point South African forces were deep inside Angola and looking for a way out. As for Congress, in the post-Vietnam War era, it had no desire to fund more foreign military escapades—especially in a place Americans knew even less about than south-east Asia. As for Pretoria, it assumed that Washington cared as much about what was going on in Angola as it did. John Vorster offered to supply America’s shock troops, but failed to demand anything explicit in return. It was a cataclysmic error of judgment — hence all the subsequent myths. For South Africa, the plan had always been to support the FNLA and UNITA until 11 November, when Portugal had committed to handing over power to whoever was “in control” of Angola. But as the date approached, it became obvious that that party would be the communist-backed MPLA. Vorster was deeply ambivalent about maintaining South Africa’s mili­tary involvement. It was one thing to covertly influence an open power struggle, quite another to overthrow an internationally recognised government, espe­cially with weak allies. Suddenly, Vorster saw the whole Angola enterprise differently. He could both satisfy the hawks in his government, led by Defence Minister Botha, who wanted the military fighting on the frontline against communism, and build bridges to the independent states of Africa. Newly enthused, on Friday 14 November, he promptly met for almost two hours with Botha, Chief of the Armed Forces Hugo Biermann, Foreign Minister Hilgard Muller, and SADF Director of Operations Constand Viljoen to help strategise how South Africa would help UNITA and the FNLA form a credible alterna­tive to the MPLA administration. With his government committing itself even more deeply than before, Vorster summoned the American Ambassador, William Bowdler, that very afternoon. It was the first meeting between the two since South African military assistance had arrived in Angola in July. Vorster requested an explicit commitment to their shared anti-communist endeavour. In his meeting, Vorster was composed and confident about Pretoria’s position in Angola. He painted a broadly positive picture of events, suggesting that “without Soviet intervention [the] FNLA and UNITA could more than hold their own,” and asked that the ambassador convey this to President Ford. Over the weekend that followed these meetings, Vorster’s optimism drained rap­idly. Following a scoop by Reuters journalist Fred Bridgland on November 15, the presence of South African troops in Angola began to be reported in mainstream Western newspapers. Confirmation that the forces of the apartheid state were interfering in the politics of an African country revolutionized the diplomatic dimension of the conflict. The slowly escalating media attention suddenly made Vorster acutely aware of South Africa’s diplomatic exposure in Angola and the need to secure concrete support from South Africa’s would-be Western allies. In his earlier meeting with Bowdler, Vorster had refrained from making specific requests for aid. Just four days later, however, South Africa made a formal request to Washington increase its assistance to the FNLA-UNITA coalition. NATIONAL SECURITY ADVISOR BRENT SCOWCROFT: Option B, encouraging South Africa. What does that include specifically? COLBY: They’d like to get their troops out, and hire mercenaries. They say that they don’t have the money to do this and have turned to us. I think that this is political dynamite. The press would be after us. They and [the] Africans would say that the MPLA is supported by the big, brave Russians, while the others are backed by the bad South Africans and Americans. That would be unpleasant. UNDER SECRETARY OF STATE FOR POLITICAL AFFAIRS JOSEPH SISCO: More than that. Your description is too mild. What is in the interests of the South Africans? They have more interest in being there than we do and they don’t need our help. I do not favor giving any support to the South Africans. Articles in major newspapers alleging direct collusion, like one entitled “South Africa Seeks US Angola Aid,” which appeared in the Washington Post on November 26, only aggravated the situation— while also ensuring that Congress would be hostile to requests for more covert funding. Realizing that its capacity to support the FNLA and UNITA militarily was finite, the Ford Administration turned to a diplomatic solution. 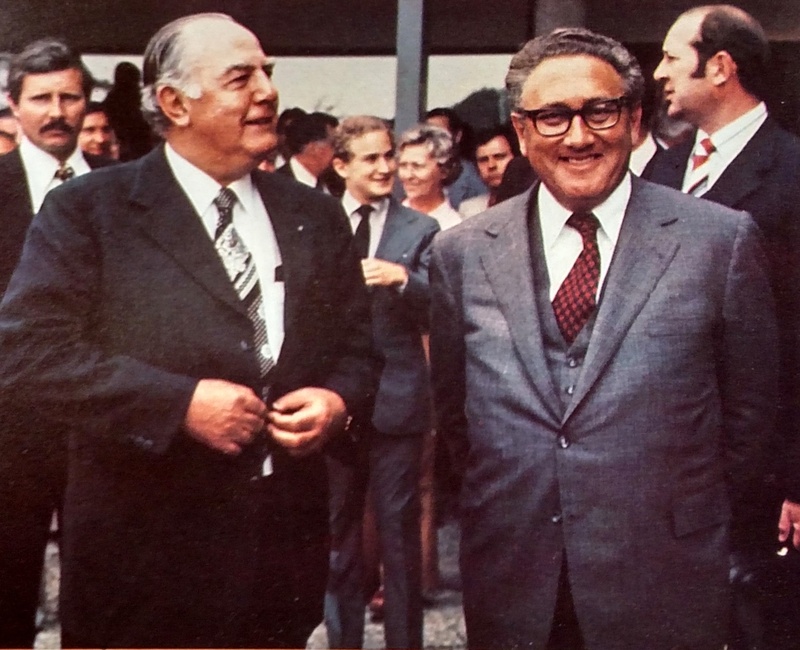 “The trend is against us in Angola,” Kissinger told Ford as early as November 19. When Washington failed to entice other countries to put their forces into Angola in place of the diplomatically toxic apartheid armies, it decided to induce Pretoria to keep its forces in place and prevent an MPLA rout. Kissinger’s was a masterclass in dip­lomatic obfuscation. His message invited the recipient — especially one as diplomatically exposed and desperate for Washington’s acceptance, like Pretoria — to perceive an expression of solidarity between the two countries. But it also carefully avoided anything that could be identified as either a positive American response to Armstrong’s request or an appeal for an additional South African commitment. Vorster was duly confused. How could Washington be simulta­neously alarmed at communist bloc success in sub-Saharan Africa, which from its perspective was a major issue for the “free world,” but not be prepared to contribute the resources to roll back the incoming forces? Vorster urgently summoned Bowdler for in-person clarification on November 29, a Saturday. The American ambassador merely reiterated Kissinger’s message, but the prime minis­ter perceived the desired reassurance that the United States shared its goal of preventing communist expansion in the region. He left the meeting satisfied, telling his Cabinet on December 3 that the Americans were “heeltemal positief” [entirely positive] about Angola. It was a total misreading of American intentions. Washington continued to string the South Africans along into December, even as the military situation deteriorated. For instance, Deputy Assistant Secretary of State for African Affairs Ed Mulcahy told South African embassy diplomats in Washington that around US$25 million had thus far been spent by the United States in support of the FNLA and UNITA and “that [the] United States would continue along these lines as long as it felt necessary.” Like Kissinger’s opaque response to South Africa’s request for more arms, Mulcahy’s message was carefully crafted to hit the emotional buttons of the isolated South African government without making unequivocal commitments. It gave the appearance that Washington would stay the course, when it was in fact looking resolutely for the exit. Vorster and his colleagues had little countervailing information at this point to suggest that things were not as they seemed. The entire enterprise had been conducted in near total secrecy. Perhaps only three or four people in the entire government accurately understood the intervention in all its dimensions—political, military, and diplomatic. This deprived Vorster of access to accurate information about American policy and its motivations (among other things). The archival documents tell a different story. On December 17, Botha’s cable home was guarded but optimistic. “Reliable sources inform me that there is a more than fifty per cent chance that the Senate will approve help to the FNLA and UNITA out of the defense budget.” Two days later the US Senate passed the Tunney Amendment by the margin of 54 votes to 22 — hardly a close vote — preventing the Ford Administration from contributing further funds to the anti­communist coalition. South Africa had been left high and dry, its troops exposed in Angola, and its diplomats in the firing line on the global stage. But that Pretoria was caught unawares by Congress’s cessation of funding and the American failure to provide more tangible support to the anticommunist coalition is at least as much an indictment of Vorster’s mishandling of the entire enterprise as it is of Kissinger’s shameless realpolitik. Even as South African troops withdrew from Angola in early 1976, the belief quickly took root that the SADF would have routed the Cuban-backed MPLA if the US Congress had not betrayed America’s commitments to stand shoulder to shoulder with the South Africans. This was, evidently, not true.) There was certainly some constructive cooperation between the American and South African covert pro­grams, but they were designed, rationalised, and implemented separately. Details remain unclear or unverified, in part because the CIA’s history of the events remains heavily redacted even after repeated Freedom of Information Act requests. But my interviews with people in a position to know, like Kaas van der Waals, who personally oversaw the UNITA training program, and the man he reported to, Viljoen, were notable for the lack of specific instances of logistical cooperation with the Americans. Washington — and Congress more specifically — was just the scapegoat for a thoroughly ill-advised and poorly planned venture. The old model of center- periphery Cold War relations was evi­dent in Pretoria’s thinking. But the relationship with Washington was of mar­ginal importance in policymaking conversations until November 1975, and was overall much less important than how Pretoria adapted Cold War concepts to its unique regional and racial context. Policymakers did not see events in Angola through the prism of South Africa’s relationship with the United States, but rather through the optics of their own homegrown philosophies. As for the Americans, they knew full well what the South Africans were doing in Angola, all while trying to tilt the balance of power in Angola through a low-priority, ham-fisted CIA operation of their own. P. W. Botha had strenuously advocated for intervention behind the scenes. He was more responsible for the debacle than anyone else within the government; Vorster had given him an inch, and he took a mile. Yet he emerged from the conflict politically stronger than ever. A little over two years later, he became Prime Minister. Bowdler saw all too well what the South African gov­ernment was doing in recasting history. “[P. W. Botha] has carefully restated [the] official position on SAG involvement in Angola this time without himself charging that US had given assurances or instructions, although that is the inevitable conclu­sion most are reaching from present as well as past exchanges on the issue,” he cabled home in May 1976. But with the MPLA victorious and thousands of Cuban troops in Angola, the United States realised it desperately had to prevent the emergence of a full-blown Cold War conflict in Southern Africa in which its de facto allies would be the racist white settler regimes. The Ford Administration reversed course and suddenly resolved to advocate for majority rule in Southern Africa. But it needed South Africa’s help to bring pressure on white regimes in Rhodesia and South-West Africa to give up power peacefully. KISSINGER: My South African colleagues had a very painful experience last year because I overestimated what we could do in Angola. The mythology of what had happened in Angola thus served divergent political interests in both countries. But it has not served historians since well at all. Bio: Jamie Miller earned his doctorate from the University of Cambridge in 2013. He specialises in the politics and ideology of apartheid South Africa, while his broader research interests include state-building in the post-colonial era, development, the nexus between race and political ideology, decolonisation, and the Cold War in the global south. He is currently the Kenneth P. Dietrich School of Arts and Sciences Postdoctoral Fellow at the University of Pittsburgh. His first book, An African Volk: The Apartheid Regime and its Search for Survival, was published by Oxford University Press in September 2016, while his most recent article, “Africanising Apartheid: Identity, Ideology, and State-Building in Independent Africa,” appeared in the fall 2015 issue of the Journal of African History. His commentary on historical and contemporary global affairs has appeared in the Atlantic, the London Review of Books, the Chronicle of Higher Education, the Sydney Morning Herald, the Age, the History News Network, the Imperial & Global Forum, and the Conversation. Piero Gleijeses, “Moscow’s Proxy?” Journal of Cold War Studies 8, no. 4 (2006): 5– 6; See also Gleijeses, Conflicting Missions, pp. 273– 299. CIA Office of Regional and Political Analysis, Section B in “Soviet and Cuban Intervention in the Angolan Civil War,” March 1977.